Want to learn how the oil and gas industry impacts communities, the environment, and politics, and how you can be part of the solution fighting to protect our land, water, and public health? Join the Water Defenders monthly meeting for a unique workshop with Water Ways, a design collective, working through a series of illustrations telling the story of water and the natural gas industry in PA, NJ, and the surrounding area. 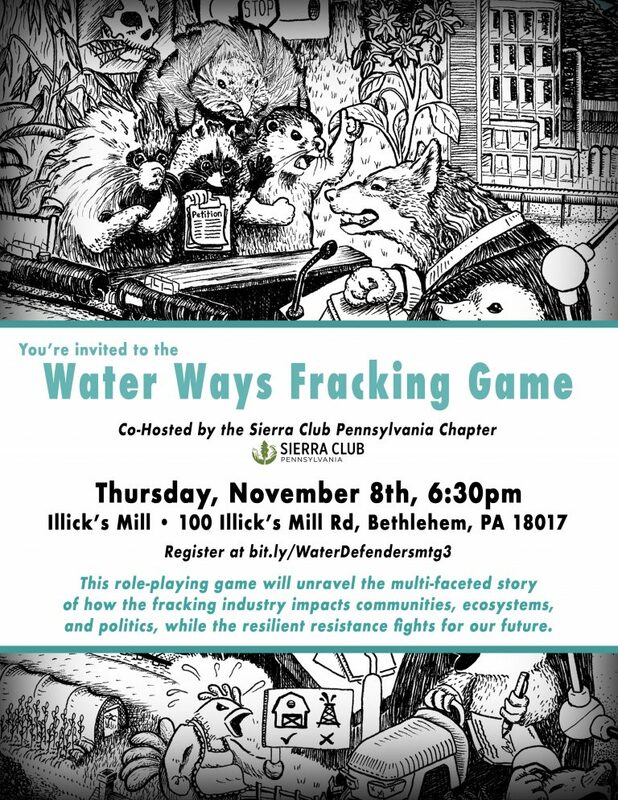 They will hold a special role-playing game that will unravel the multi-faceted story of how the fracking industry impacts communities, ecosystems, and politics, while the resilient resistance fights for our future. All are welcome! Come out for socializing, pizza, and #cleanwater advocacy! Organized by the Pennsylvania Chapter of the Sierra Club.